An early map depicting Teiaiagon at Lac de Frontenac, now known as Lake Ontario. Also visible is the Algonquin village of Ganatsekwyagon (as Canatehekiagon). Teiaiagon was an Iroquoian village on the east bank of the Humber River in Toronto, Ontario, Canada. It was located along the Toronto Carrying-Place Trail. The site is near the current intersection of Jane Street and Annette Street, at which is situated the community of Baby Point. Percy Robinson's Toronto Before the French Regime shows Teiaiagon as being a jointly occupied village of Seneca and Mohawk. Helen Tanner's Atlas of Great Lakes Indian History describes Teiaiagon as a Seneca village around the years 1685-1687, although it existed before that time, and as a Mississauga village around 1696. Étienne Brûlé passed through Teiaiagon in 1615. The village was on an important route for the developing fur trade industry, and was also "surrounded by horticultural fields". It was said to be about "a day's journey from the Toronto Lake, our present Lake Simcoe". On November 18, 1678 René-Robert Cavelier, Sieur de La Salle departed Fort Frontenac for Niagara in a brigantine with a crew including La Motte and the Récollet missionary Louis Hennepin, following the north shore of Lake Ontario to mitigate the effects of a storm. The ship was grounded three times, forcing the crew to stop at the mouth of the Humber River on 26 November. The surprised inhabitants of the village "were hospitable and supplied them with provisions". On December 5, the ship set off after being cut out of the ice with axes. Before departing, "La Motte's men bartered their commodities with the natives" for corn. Hennepin and others have recorded that the village was inhabited by as many as 5000 people and had 50 long houses. La Salle camped at Teiaiagon several other times, once in the summer of 1680, and "perhaps twice in 1681" during his expeditions. There was a 10-acre (40,000 m2) burial ground located in the central part of the village. The Senecas left the village, either pushed out by, or voluntarily for, the Mississaugas by 1701. 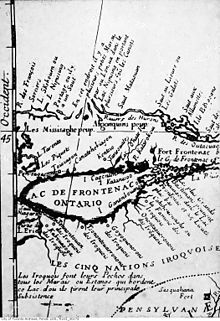 With the removal of the Iroquois from southern Ontario by the Mississaugas, the Anishinaabe and French trade began to flourish in the region shortly after the Great Peace of Montreal of 1701. Associated with this trade, there was a very small French garrison or magasin royale located somewhere by the site of Teiaiagon from 1720-1730. In 1730 the French garrison was located downriver of the site. A store was later built at the mouth of the Humber in 1750 and Fort Rouillé at the same time east of the Humber. The Mississaugas did not live at the site of the village of Teiaiagon, but had a village located across the Humber River, on the west bank of the river, near Old Mill Road and Bloor Street from 1788-1805. James Bâby from Detroit in 1816 acquired the land now called Baby Point and only had orchards located on the site of Teiaiagon. The site was relatively undisturbed as it was not farmed. The Teiaiagon area was acquired by the government for military fortress and army barracks, but then was sold to Robert Home Smith who began developing the Baby Point subdivision in 1912. In 1949, at the south-west corner of Baby Point Road and Baby Point Crescent, a plaque was erected, briefly mentioning "Taiaiagon." Possibly because early European explorers had difficulty in transcribing First Nations names into European orthographic systems, numerous spelling variations exist. These include Taiaiako'n, Taiaiagon, Teyeyagon, and Toioiugon. The name "Teiaigon" appears on a 1688 map of New France drawn by Jean-Baptiste-Louis Franquelin based on "sixteen years' of observation of the author". It was indicated to be on the eastern side of a small bay, from which a portage route led to the west branch of Lake Taronto. Excavations at Baby Point were first conducted in the late nineteenth century. Records from that excavation have been lost, though it is known that they revealed "traces of palisade walls". In the late 1990s and early 2000s another excavation, conducted as a result of installation of a natural gas line to the residential neighbourhood, discovered the burial plots of two Seneca women, which were dated to the 1680s. One of the women was buried with a moose antler comb engraved with a rattlesnake-tailed panther, "possibly representing Mishipizheu", which morphs into a bear. The other woman was buried with three brass rings and a carved moose antler comb depicting "two human figures wearing European-style clothes flanking an Aboriginal figure". Another burial plot on Baby Point was found in 2010 when a house was being renovated. Artifacts were studied and a ceremonial reburial took place. Just north of the site, in today's Magwood Park, is "Thunderbird Mound", which is believed to be an ancient burial mound. The site has not been studied for its archaeology. The site is considered threatened by erosion and pedestrian traffic by the Taiaiako'n Historical Preservation Society. Wikimedia Commons has media related to Teiaiagon. Eid, Leroy V. (Autumn 1979). "The Ojibwa-Iroquois War: The War the Five Nations Did Not Win". Ethnohistory. Duke University Press. 26 (4): 297–324. doi:10.2307/481363. Lizars, Kathleen Macfarlane (1913). The Valley of the Humber. Global Heritage Press (2010), William Briggs (1913). ISBN 978-1-926797-14-4. Schmalz, Peter S. (1991). The Ojibwa of Southern Ontario. Toronto: University of Toronto Press. ISBN 0-8020-2736-9. LCCN 94137640. OCLC 21910492. Tanner, Helen Hornbeck; Hast, Adele; Peterson, Jacqueline; Surtees, Robert J.; Pinther, Miklos (1987). Atlas of Great Lakes Indian History. University of Oklahoma Press. ISBN 0-8061-2056-8. Ronald F. Williamson, ed. (2008). Toronto: A Short Illustrated History of its first 12,000 Years. Toronto: James Lorimer & Company Ltd. ISBN 978-1-55277-007-8. ^ a b "Archaeological Significance | Baby Point Heritage Foundation". Baby Point Heritage Foundation. Retrieved July 19, 2016. ^ "Magwood Park". Taiaiako'n Historical Preservation Society. Retrieved July 19, 2016.